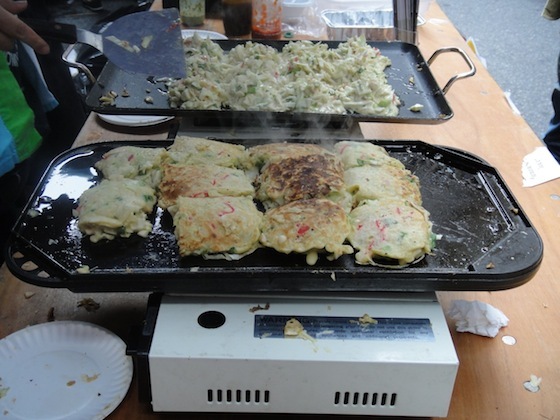 Work obligations prevented me from attending Japan Day in Central Park on Sunday, May 22, but I managed to catch the last half hour of the Japan Block Fair. 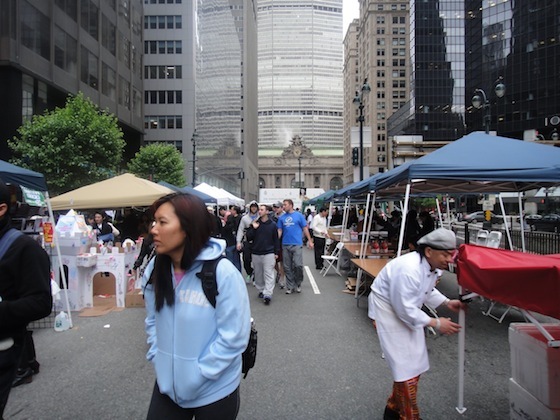 Comprising a narrow one-block strip of Park Avenue between 39th and 40th Streets, Japan Block Fair offered tastes, goods, and entertainment native to Japan. Although the performances were over and many vendors were tearing down their booths by the time I arrived, there were still a few cool things for me to see. 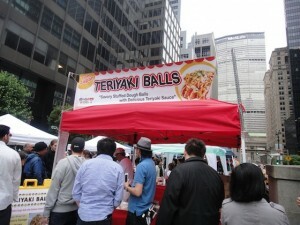 Of course, food is always a big draw at any street fair. Umi no Ie, an East Village restaurant, sold triangular-shaped onigiri (rice balls) next to Suzuki Farms, which grows Japanese vegetables in Delaware. On this chilly day Go! Go! Curry! 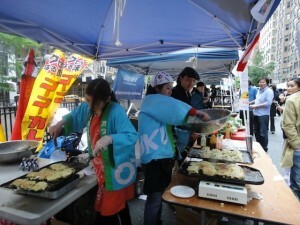 sold out of their delicious Japanese curry – a personal favorite – but Kazuko Nagao, the Okonomiyaki Queen, and her crew were still making their trademark Hiroshima-style okonomiyaki, a savory Japanese pancake. Mimi and Coco, two young Japanese ladies who make teriyaki balls, had a long line of people waiting for their street food at closing time. 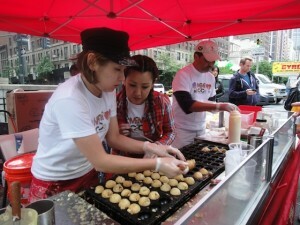 Based on takoyaki, a Japanese comfort food in which chucks of octopus are grilled in dough, Mimi and Coco make three types of teriyaki balls to appeal to Western palates: Country sausage, shrimp, and organic potato. 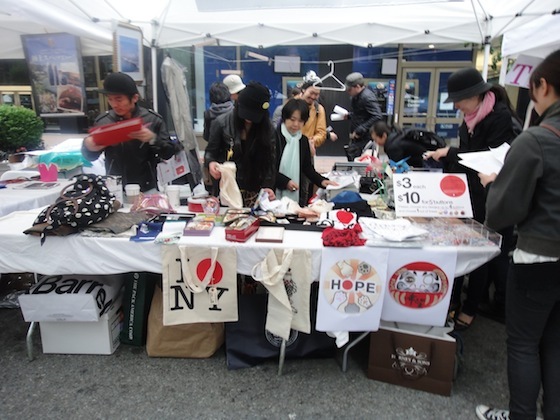 Because of the devastation of northeastern Japan in the wake of the earthquake and tsunami of March 11, many booths at Japan Block Fair were dedicated to raising funds for Japan relief. In addition to a yard sale and other booths offering a percentage of proceeds to help aid the recovery process, HOPE JAPAN sold adorable pins whose designs were donated by artists. 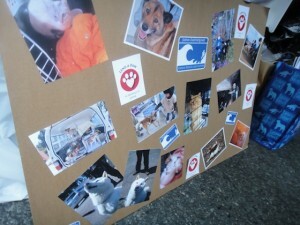 HOPE JAPAN donates all profits from the sale of the pins to the Japan Society’s Japan Earthquake Relief Fund. Wuhao new york, an online tenugui seller, is a regular at street fairs. 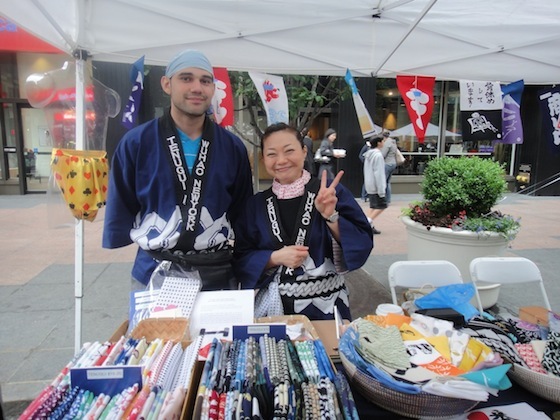 Owner Ruri Kippenbrock sold her usual stock of the useful and decorative Japanese cloths, but she also introduced a special way for New Yorkers to reach out to Japanese who have been displaced by the earthquake and tsunami. Through the “I Heart Japan Tenugui Project,” you can purchase a special tenugui for $15 and write a personal message on a heart-shaped card. 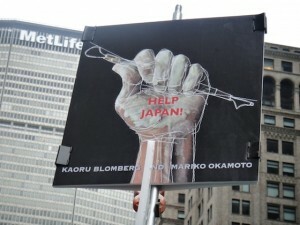 In turn, wuhao new york will send a mame-shibori tenugui (polka-dotted towel) and your message to Japan. 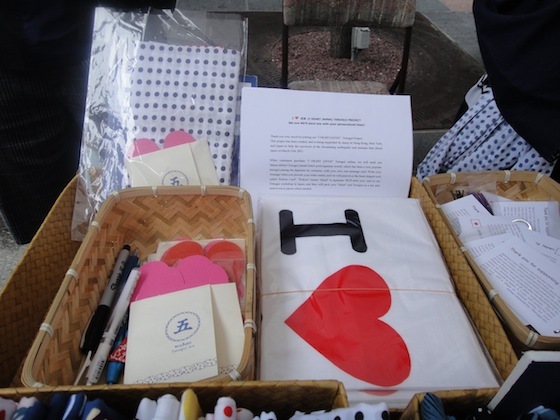 A Buddhist monk in Akita prefecture in northern Japan will distribute Kippenbrock’s collected messages and towels to shelters in the hard-hit prefectures of Iwate and Miyagi. Kippenbrock has collected more than one hundred messages. To add to that number, see her website for details and contribute a message of your own. Wuhao new york's "I Heart Japan Tenugui Project"
While I thought it was unusual to hold the Japan Block Fair on the same day as Japan Day, a shuttle bus ran between the two events, allowing people to appreciate both.